George Osborne features in the news a lot. Recent coverage has detracted from his political stature – what with Iain Duncan Smith’s resignation from the Cabinet. I have become George’s ‘spin’ doctor. 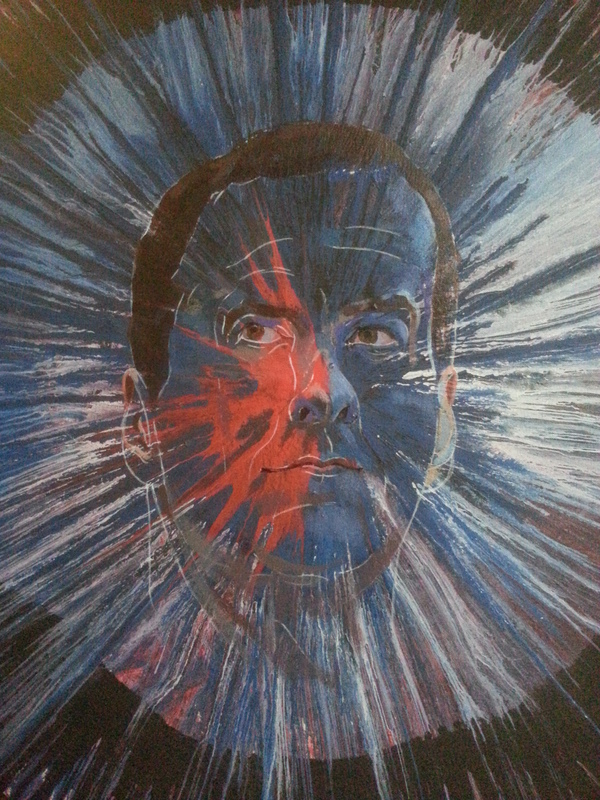 This is my painting of his fizzog, juxtaposed onto and into a circular spin painting. The painting began in black and white. Black streaked across white to give a zebra effect. Then I placed thin glazes of colour over this, making a starting point for ‘George’. I looked at several photos of the Chancellor online, choosing one which captured an appearance of pride, as if he’s poised for something …… BIG. But alas, direct hit! He should never have played paintball with Alan Dedman. I chucked some white and blue over matt gel medium, spun it some more, put a limiting circle of black round the outside – then flung a meaningful cup of scarlet into the mix. I think the result is rather fetching. As one visitor to my studio commented: ‘It makes him look like some kind of ruler or dictator. Big Brother-ish’. Well, at least it’s patriotic! Red, white and blue. The painting might have some further work done to it yet. Creating form amidst the chaos is challenging, especially when using photo reference. Even if he did have time, I think Mr. Osborne would think twice about sitting for me. My studio is a dangerous place when canvases are whizzing round at Mach 3 rpm. I’m grateful to Damien Hirst for suggesting spin painting. Creative effects can be achieved by varying the speed and direction of spin, the viscosity of paint and interleaving it with different painting mediums. This makes the process wonderful to observe. The surface continues to swim and move in one’s perception, even after the artwork has become stationery. It’s great fun and has it’s applications in the world of figurative art. However, be warned – spin painting is a dangerous, messy activity, do not try this at home! If you would like Alan to take your favourite politician for a spin, please use the contact form on this blog, below the social media buttons and leave a message – Alan will do his best to oblige. All contact details are private; they are not publicly visible.